Dr. Borisoff focuses his research on how technology development can improve accessibility and mobility for people with SCI. One focus of his work is on expanding patients’ ability to interact more fully with others, the environment, and their world. This includes dynamic wheeled mobility, the ability to change your position in a wheelchair to suit different daily activities. Rehabilitation Engineering Design looks at how people use devices in real life and, from these observations, designs better versions of the devices. In the long term, Dr. Borisoff wants to merge current models with newer technologies like robotics and exoskeletons in order to increase the ways in which technology can improve the lives of people with SCI. Dr. Borisoff is the Canadian Research Chair in Rehabilitation Engineering Design at the British Columbia Institute of Technology. He is also a Research Director at BCIT and an Adjunct Professor in the Department of Occupational Science and Occupational Therapy and the Biomedical Engineering Program, both at the University of British Columbia, as well as a Principal Investigator at ICORD. He completed his B.A.Sc. 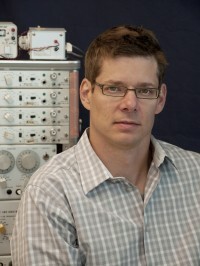 in engineering physics and his Ph.D. in neuroscience at the University of British Columbia. Having access to a full-time rehabilitation engineer like Franco Chan, who can provide on-site, in-person skills, is Dr. Borisoff’s favourite aspect of working at ICORD. In some cases, a product idea can be taken from research and design, through testing, and even into clinical trials within one building. He also excited by the ability to collaborate with diverse groups of researchers and bring them together on new projects. Dr. Borisoff says the best thing about his job is that he is his own guinea pig; he tests everything he designs, even if it ends up being awkward or difficult to use. Part of what drives his research is not asking anyone else to do something he hasn’t tried himself! Dr. Borisoff collaborates with Dr. Bill Miller, Dr. Ben Mortenson and others on the impact of mobility issues on social participation. With Dr. Christopher West and Dr. Tania Lam, Dr. Borisoff is studying “hybrid exercise” for SCI (and other disabilities), exercise that combines both arm and leg movements in synchrony. He is also working with Dr. Bonnie Sawatzky, Dr. Ben Mortenson, and rehabilitation engineer Franco Chan on data logging / monitoring of wheelchair use in the community. Dr. Borisoff helped develop the Elevation Wheelchair. This new wheelchair design is light-weight and has on the fly adjustable seating; both the seat height and backrest angle can be adjusted easily, making it a real-time wheelchair designed to suit various functional activities. Led by graduate student Jacquelyn Cragg in collaboration with Dr. John Kramer and others, Dr. Borisoff’s lab has further documented the myriad health and lifestyle complications impacted by secondary complications after SCI. They have contributed data about heart disease, stroke, chronic pain, type 2 diabetes, and other factors, as well as possible mechanisms that contribute to a reduced quality of life after SCI. There are currently no openings in Dr. Borisoff’s lab. Please contact Dr. Borisoff with inquiries. Watch Dr. Jaimie Borisoff’s Café Scientifique presentation on the challenges faced by Paralympic athletes with SCI. Best, KL et al.. 2019. Smartphone-Delivered Peer Physical Activity Counseling Program for Individuals With Spinal Cord Injury: Protocol for Development and Pilot Evaluation.. JMIR Res Protoc. doi: 10.2196/10798. Cragg, JJ, Kramer, JLK, Borisoff, JF, Patrick, DM, Ramer, MS. 2019. Ecological fallacy as a novel risk factor for poor translation in neuroscience research: A systematic review and simulation study.. Eur. J. Clin. Invest. doi: 10.1111/eci.13045. Borisoff, JF, Ripat, J, Chan, F. 2018. Seasonal Patterns of Community Participation and Mobility of Wheelchair Users Over an Entire Year.. Arch Phys Med Rehabil. doi: 10.1016/j.apmr.2018.02.011. Khalili, M, Borisoff, JF, Van der Loos, HFM. 2017. Developing safe fall strategies for lower limb exoskeletons.. IEEE Int Conf Rehabil Robot. doi: 10.1109/ICORR.2017.8009266. Inskip, JA et al.. 2017. Dynamic wheelchair seating positions impact cardiovascular function after spinal cord injury.. PLoS ONE. doi: 10.1371/journal.pone.0180195.